Devil's matchstick growing on moss-covered rock. Photos by Elyse Matthews (left) and John Reynolds. 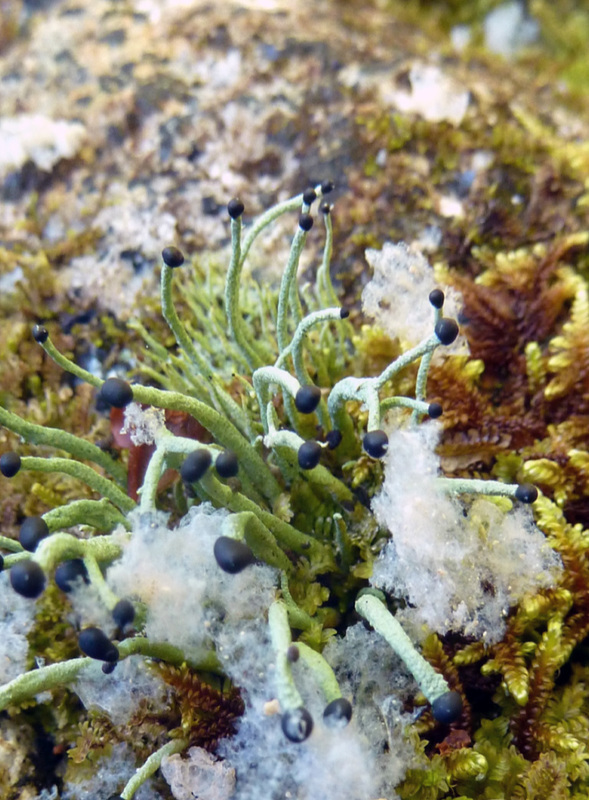 Devil's matchstick is a distinctive club lichen that looks like an oddly-coloured match: the straight to somewhat curved or wavy club is whitish to pale greenish with a shiny black ball-shaped tip (the apothecium, or fruiting body). These 'matchsticks', which are usually unbranched, are the species' secondary thallus (body of the lichen); they grow from a thin whitish crust, which is the primary thallus. This common species grows on rock in cool, moist forests at all elevations. It is more common at lower elevations, and is often found near waterfalls. It is found in western North America, ranging north to southern Alaska, east to Idaho, and south to California. It is rare east of this range to Ontario; it is also found in eastern Eurasia. Enchanter's matchstick (Pilophorus clavatus) and charred matchstick (P. nigricaulis) are somewhat similar in that they are club-shaped lichens with black shiny fruting bodies; the former has elongated fruiting bodies, while the latter has shorter and thicker clubs with a rough, warty texture. However devil's matchstick's elongated clubs and round fruiting bodies makes it easily recognizable. 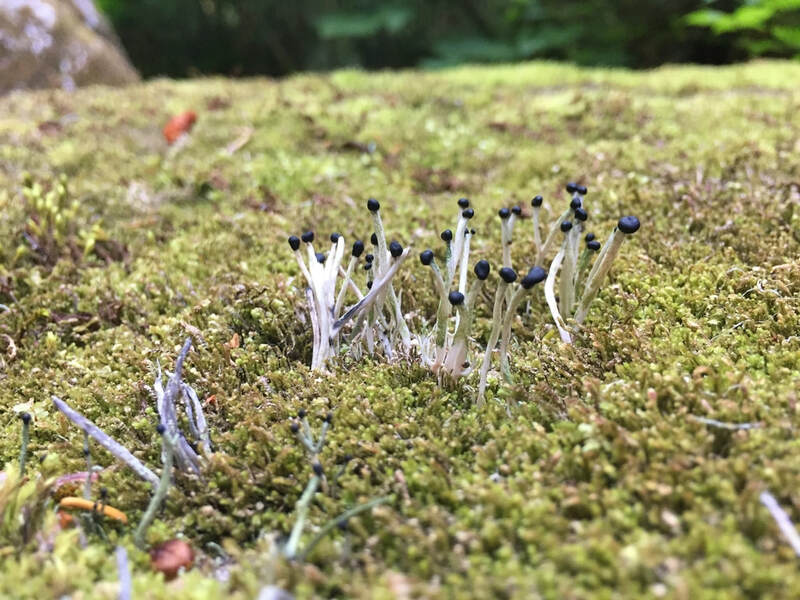 ​Rock-colonizing lichens (saxicolous lichens) like devil's matchstick are important in soil formation; they slowly loosen microscopic particles of rock, and by accumulating these particles as well as dust and other airborn particles they pave the way for mosses and other species to grow on that substrate. DeRoy, B. (2012). Pilophorus acicularis. Botany Photo of the Day. UBC Botanical Garden and Centre for Plant Research. Vancouver, BC. Goward, T. (1999). The Lichens of British Columbia Illustrated Keys Part 2 - Fruiticose Species. Special Report Series 09, BC Ministry of Forests, Lands, and Natural Resource Operations Research Branch. P. 200. Pojar, J. and MacKinnon, A. (1994). Plants of Coastal British Columbia. Vancouver, BC: Lone Pine Publishing. P. ​499.